Cherry City Kitties : My first event at the TCC! 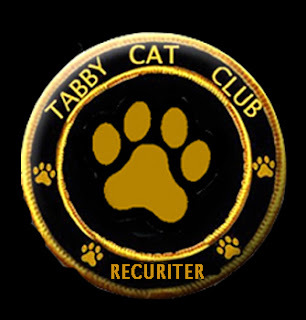 Hey everyone, it's my very first event over at the Tabby Cat Club, so c'mon and visit! And don't forget, if your a blogging Tabby Cat and want to join the fun, leave a comment and me and my official recruiting brother Dexter will come visit you and help you get signed up. We're trying to reach 100 Tabbies by our 2nd anniversary in October! The Tabby Cat Club ! It looks like fun. I can't remember how to log in. Can Jewel join the TCC? Someone said she might be "torbie" but she does have those tabby stripes. Oh my goodness yes she can join! I'm a torbie, that makes us extra special! email my mom at cherrycitykitties AT gmail DOT com and she'll get you started! I'll see you at the TCC soon. Enjoy your time at the TCC. Have a wonderful Wednesday. It certainly looks like fun. We'll go check it out! Great job, sister Willow! We think you did a wonderful TCC post today. And you and Dexter sure are doing a fantastic recruiting job ... we'll be at 100 members in no time! We'll be there! Stay cool, Willow! Seekret PeeEss: Our sister Pia has a pin-up poster of your brother Dexter in our Cat Den. She spends too much time in there kissing it. Ewww! I won't tell him, I don't want him to get a big head... the picture made it look gigundous as it was! 100 tabbies? that's a lot of tabbies! good luck!